Pioneers in the industry, we offer fulvic acid and royal star humic acid from India. We are the leading manufacturer of Fulvic Acid. Creating of Humic Acid Fertilizer for Plants such as Humic Acid 14 + Fulvic Acid at its best, with upmost quality. Growth promoting agent, root developing and for crop shining. Any Field Crops and/or Horticultural Crops, Vegetables. Dose 10 gm /15 ltr water pump. 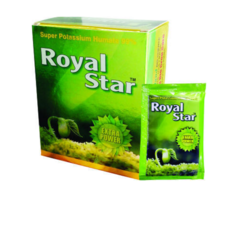 We are the leading manufacturer of Royal Star Humic Acid and Bio-fertilizer. Creating of Humic Acid Fertilizer For Plants such as Humic Acid 99%at its best, with utmost quality. Growth promoting agent, root developing and for the Better crop. 100% water soluble super potassium humate shiny flakes (100% China Imported product). Mix with all types of Pesticides/Fungicides and PGR product. Availability: in 12 gm, pouch 50 gm, 100 gm and 250 gm packing size. 10 gm /15 ltr water pump.